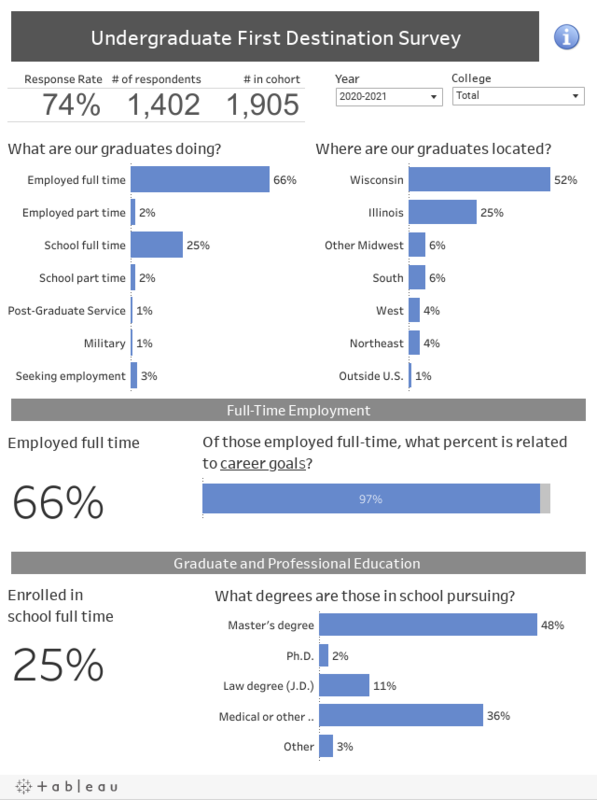 The Undergraduate First Destination Survey investigates the employment and enrollment into graduate/professional school activities of recent bachelor's degree recipients with the goal of estimating post-graduation outcomes rates. Use the pull-down menus to see data sets by graduating class and college. Initial data are gathered just before graduation via an online instrument. Students participating in May commencement complete the survey while waiting to pick up their caps and gowns for the graduation ceremony. For those who do not respond to the initial survey, or indicate they are still seeking employment, an online survey is sent to the graduate via email. A third follow-up to non-responders and those still seeking employment involves contacting the graduate via social media or phone. National Student Clearinghouse and Marquette University enrollment data are also utilized to place non-responders into the outcome category related to enrollment in graduate/professional school. Results from this annual survey are distributed to many campus constituency groups and are used to inform current and future students of first destination post-graduation outcomes.